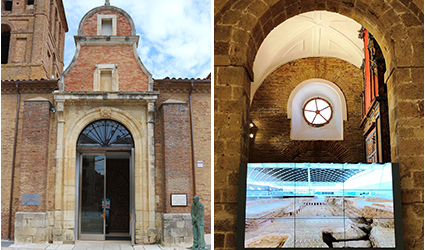 The Museum of the Roman Villa La Olmeda is installed in the Church of San Pedro in Saldaña, ceded by the Bishopric of Palencia to the Provincial Council of Palencia for this purpose. 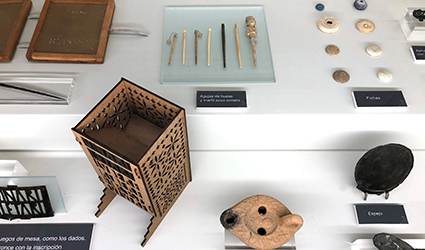 Since the opening of La Olmeda to the public in 1984, a selection of the objects found in the excavations of the villa was exhibited in it to complement the visit to the archaeological site. 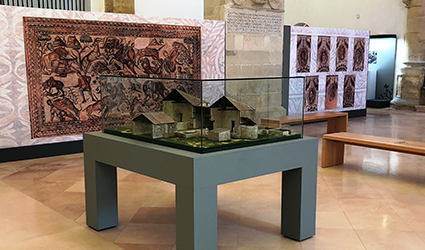 On July 4th, 2018, the Museum's current installation was inaugurated, after a complete remodeling of the Church of San Pedro and its enviroment. In the Museum it is possible to take a tour of the material culture of La Olmeda, in which the main objects found in the excavations are integrated into a modern didactic discourse that allows the visitor to get closer to the daily life of the inhabitants of the villa, watching the objects they used in their dress, food, leisure and religious or funerary rituals. In addition, the models and projections with virtual reconstructions take the viewer into the world of La Olmeda. Finally, in the last section you can get an idea of how La Olmeda, from its discovery in 1968 until today, has become a cultural reference in the region. The Museum is complemented by a room where you can see the Mozarabic Paten from Valcabado, next to Saldaña, and a facsimile of the famous Beato of Valcabado that is preserved in the University of Valladolid. In this same room you can see some samples of the historical-artistic heritage of Saldaña and its region.To sum up, 305 various objects among fragments of mosaic, tableware fine terra sigilatta pottery, personal adornment, weapons for hunting, jars of glass, leisure items as well as samples of the important collection of late roman coins that allow the visitors to get an idea about how they lived at La Olmeda and the culture of that time.